WizKids has another preview up for the Yu-Gi-Oh HeroClix set they're working on. This time it's the Gate Guardian. As our special Christmas Day present to you, we continue our previews for Yu-Gi-Oh! HeroClix: Series One! Today we take a look at a game mechanic in this set that should be somewhat familiar to Yu-Gi-Oh! fans: Fusion! 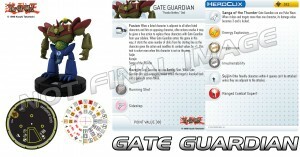 To help us in understanding this trait, we are pleased to present the Gate Guardian!